This is a brilliant all-day tour of about 3hrs, 30mins driving through stunning scenery and with great stops for sightseeing, shopping and seafood. Heading North from Ardbrecknish join the A819, remembering to pull over briefly at the viewpoint for Kilchurn Castle on the easterly shore opposite the Castle; it’s the best vantage point and a great photo opportunity. 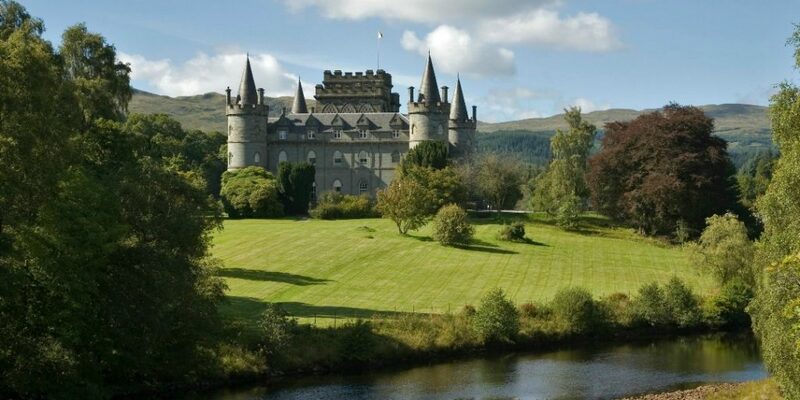 When reaching the A85, take a left in the direction of Oban. 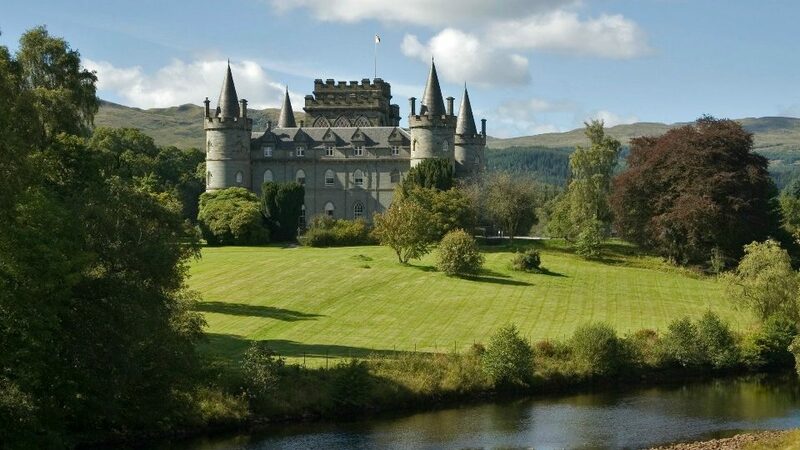 Your 35 minute drive to Oban runs along the northerly shoreline of Loch Awe and your first point of interest is the spectacular St Conan’s Kirk, listed recently in Scotland’s top-10 outstanding buildings. 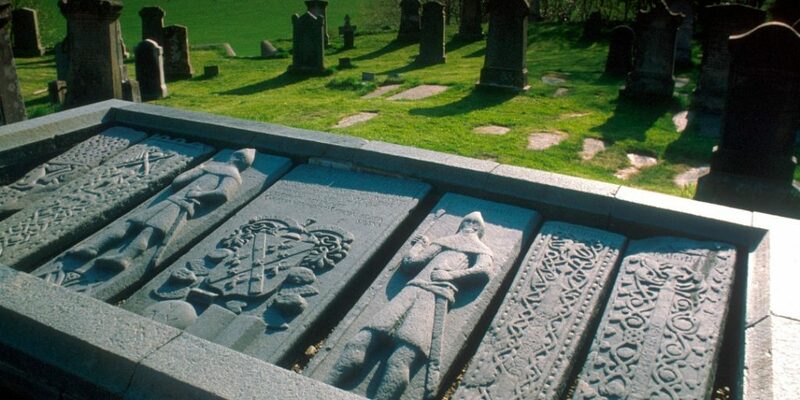 Open year-round Monday-Sunday, the Victorian-era Kirk is a fascinating diversion to walk around and marvel at its baroque and gothic stylings and the outstanding craftsmanship of its stonework, carvings and interiors. Tours can be arranged in advance. Also notable is the tea room in St Conan’s Gatehouse, which opens 10am-4pm Monday-Friday during summer months. 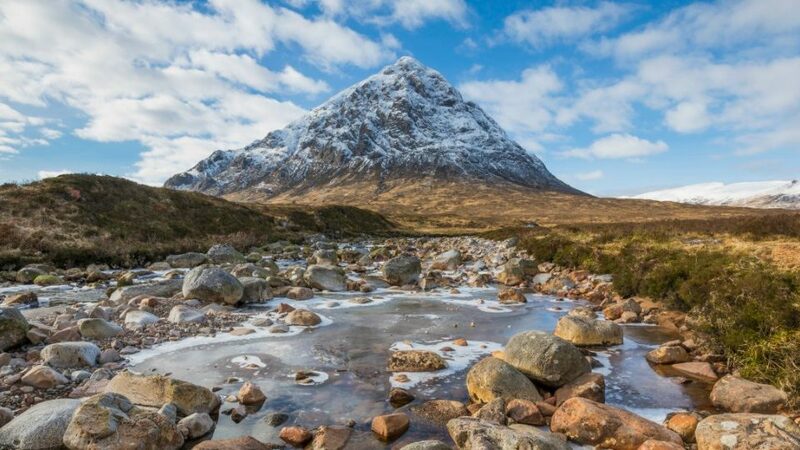 Continuing along the A85 and through the village of Taynuilt, you’ll reach a long stretch of road that skirts the coast line of Loch Etive, a sea loch of outstanding beauty. A short stop at Connel allows you to view the Falls of Lora, the dramatic tidal race at the mouth of Loch Etive beneath Connel Bridge. 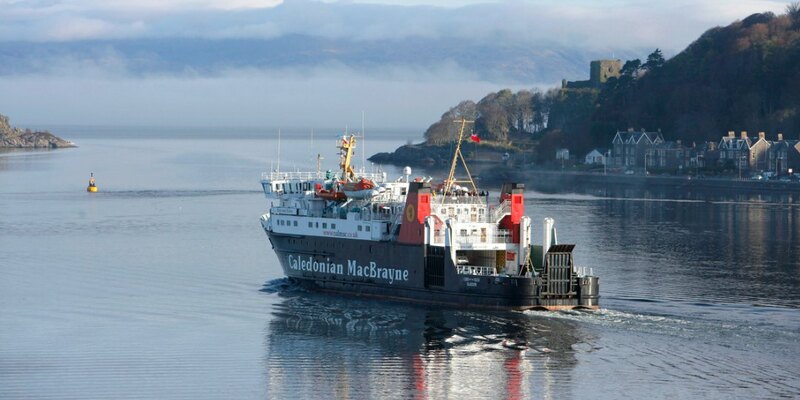 And onwards to Oban, Scotland’s Seafood Capital and the ‘Gateway to the Isles’. 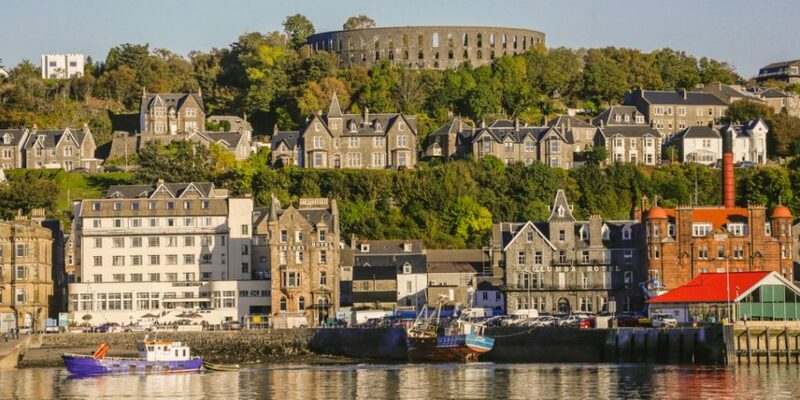 This harbor town offers plenty for visitors; numerous shops to peruse, Oban Distillery in the heart of the town, a promenade to stroll and watch the coming and goings of CalMac ferries, trawlers and yachts and, of course, McCaig’s Tower which overlooks the town. Also known as McCaig’s Folly, this Colosseum-like structure was built at the turn of the last century to provide work for local stonemasons; it affords magnificent views and photo opportunities. 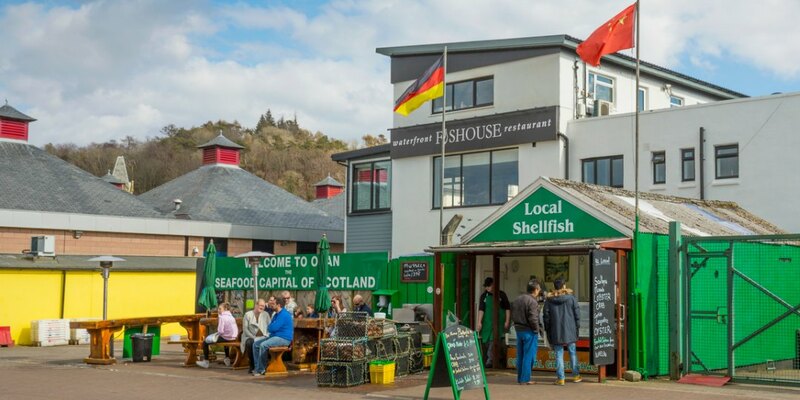 If you want to taste Oban’s locally caught seafood, you can’t beat the Oban Seafood Hut on the ‘railway pier’. Open daily 10am-6pm, it’s quite an institution and, from its unassuming shed-like counter, serves fresh Lobster, Crab, Scallops, Mussels and the best prawn sandwiches we’ve ever tasted. It’s great value too. Now for the Isle of Seil; head out of Oban in a southerly direction on the A816 towards Lochgilphead and, after 8 miles, take the B844 which branches off right towards Seil. Barely an island, Seil is separated from the mainland by only the thinnest of sea channels which is spanned by the elegant 18th century humpback Clachan Bridge, otherwise known as the ‘Bridge over the Atlantic’! 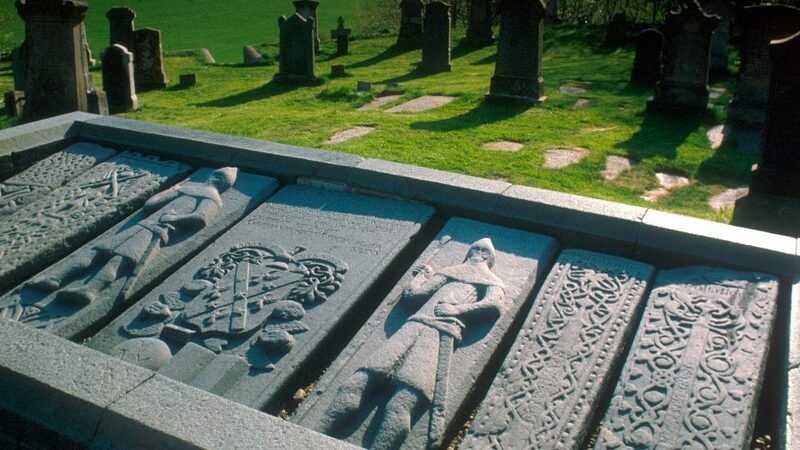 Once on Seil, you’ll soon see why Seil and the adjacent Isles of Easdale, Luing and Belnahua are known as the ‘Slate Islands’; the ground was naturally rich in slate and, from the mid 1500s until the 1960s, quarries operated. The white harled quarry workers cottages in the pretty village of Ellenabeich are wonderfully preserved and, after a stroll around the village and its harbor, you can stop at the Oyster Bar, Restaurant and Brewery. Also worth a visit is the Highland Arts visitor shop, which sells all manner of tourism products plus an eclectic range of arts and crafts. 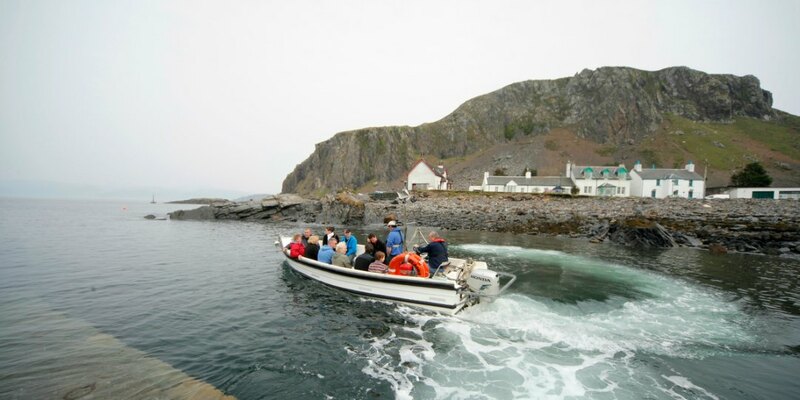 A very short trip (200 metres) on the local rib ferry takes you to the car-free island of Easdale, where you can see the historical remains of slate quarries, now giant pools filled by the sea and inhabited by a variety of flora and bird life. In October each year, Easdale hosts the world stone skimming championships. For the more adventurous minded, the exhilarating Seafari Adventures tours depart daily during the summer from Ellenabeich. 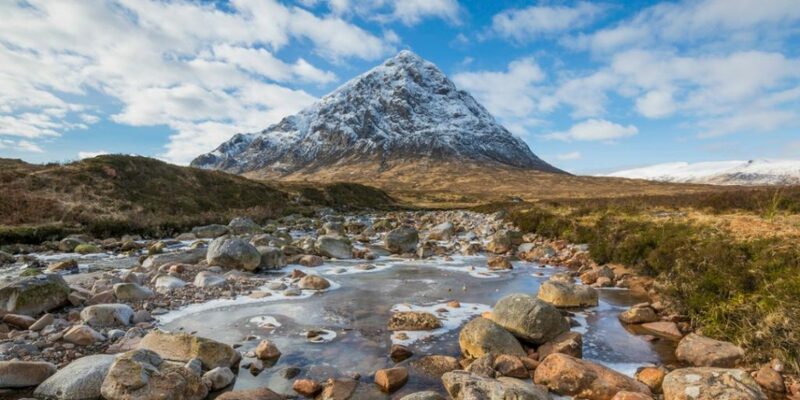 Booking in advance for their tours is essential; the most popular excursions are 2.5hrs and give you the opportunity to see whales, seals, dolphins, porpoise, basking sharks and otters as well as the thrill of the infamous Gulf of Corryvreckan, the world’s third largest whirlpool. Back over the Clachan Bridge to rejoin the A816 and head south past Kilmelford and Loch Melfort. 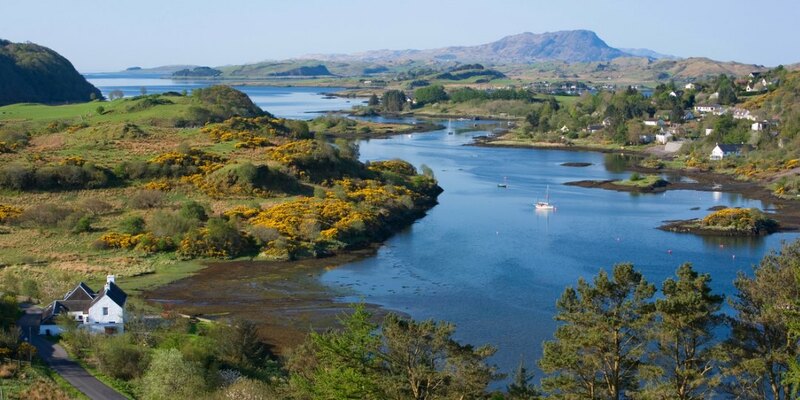 If time allows, you can stop at Arduaine Gardens at the head of Loch Melfort. Onwards past Croahb Haven, a favourite mooring for Yachts on Scotland’s West Coast, and you’ll shortly find the left turn off onto the B840 signposted Ford. From here head back up the easterly shoreline of Loch Awe to Ardbrecknish.